Emirates will be launching a series of new products and cabin improvements this year for both its A380 and 777 aircraft. 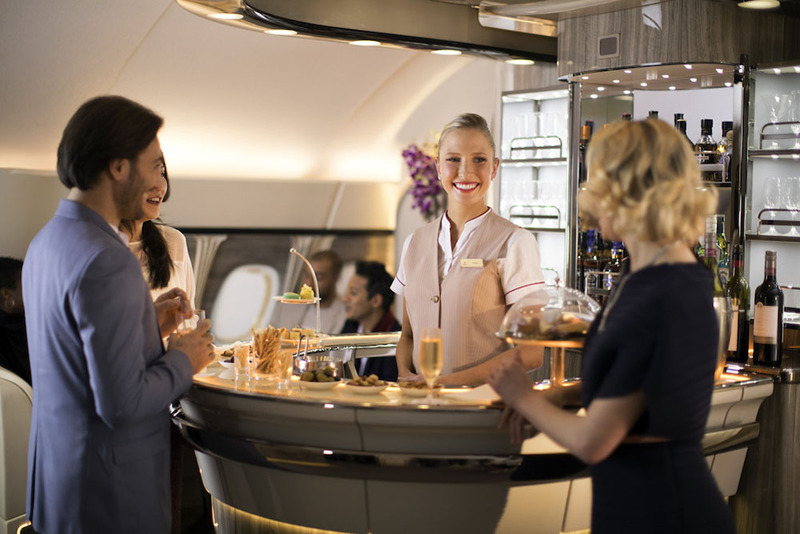 A major highlight will be the introduction of a new Onboard Lounge for its Airbus A380, available for the use of Emirates’ First Class and Business Class passengers. The new lounge will make its first public appearance at ITB Berlin (one of the world’s largest tourism trade shows) and will make its operational debut in July 2017. Key features include additional seating space, lighter colours and soundproof curtains so passengers aren’t disturbed by the noise from the lounge. The bar will still retain its horseshoe shape but will offer more seating space, accommodating 8 people seated as well as up to 26 passengers standing. Inspired by private yacht cabins, there will be a a new seating arrangement along the windows of both sides of the bar, with each seating area offering a table and window view. The new Onboard Lounge will also have an airier look and feel, with light champagne-coloured upholstery and glossy, dark wood accents. Emirates will also introduce soundproof curtains to partition the Onboard Lounge area from the other cabins, meaning guests can chatter amongst themselves without disturbing other passengers. Other new features will include soft ambient lighting options, new window blinds with integrated LED mood lighting, and subwoofers for surround sound. The lounge also features a 55 inch LCD screen so customers can view the latest flight information, or enjoy live TV broadcasts of the latest news or sports updates. 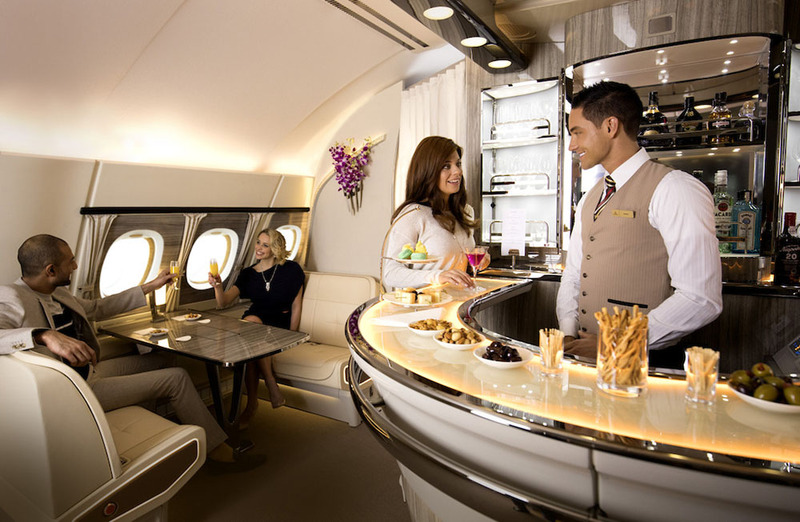 The new lounge will still be in the same location as it was before, located on the Upper Deck of the aircraft. Inside the lounge First and Business Class guests can enjoy gourmet canapés, handpicked wines, limited edition fine spirits and signature cocktails prepared by the bartender.